Felix Cheong is the author of 12 books, including four volumes of poetry, two young adult novels and a trilogy of flash fiction stories, Singapore Siu Dai, which satirises life, politics and mannerisms of the Lion City. His works have been nominated for the prestigious Frank O’Connor Award and the Singapore Literature Prize. His latest, Use Your Head, is a children’s illustrated activity storybook. Conferred the Young Artist of the Year for Literature in 2000 by the National Arts Council, he was named by Readers Digest as the 29th Most Trusted Singaporean in 2010. Cheong has been invited to read at writers’ festivals all over the world: Edinburgh, West Cork, Austin, Sydney, Brisbane, Christchurch, Kuala Lumpur, Ubud and Hong Kong. Cheong, who holds a master’s in creative writing from the University of Queensland, is currently an adjunct lecturer with Murdoch University, University of Newcastle, Singapore University of Social Sciences and LASALLE College of the Arts. What was your early reading life like, what did you read and what books left an impact on you? How did you come to writing? Was there a pivotal moment when a lightbulb went off? Or, was it a gradual process? I wrote a poem about this a few years ago and it answers your questions. As you read by your easy chair or bed. As you turn out the world. My voice hardly a spittle. In primary one. The title now escapes me. But it showed me an escape door. and rhythm sings. I followed, intrigued. And so a life in books began. Making a meal of a book a day. More when my eyes didn’t give way. Till I became plump in the head. Till the stories flushed out my head. At it till I was worthy to be picked. She had the pieces laminated. From my readings in the university. To Conrad, Lee Tzu Pheng and Eliot. Still building doors for others. My latest collection of poetry, B-Sides and Backslides: 1986-2018, was published at the end of August last year (2018). You could say it was, in the most Catholic way, an accidental child (since my creativity is not known to practice birth control!). In January, I was going through old drafts of poems for examples I could show my creative writing students. The lesson was something about hoarding hardcopy drafts because you’d never know how valuable they’d be on eBay after you’re dead and gone. Many of these pieces were, not surprisingly, either unfinished, unpolished or left to cobweb over time. Re-reading them (some could be carbon-dated to the 1980s), I finally saw how they could be cleaned up. It was as though they needed to collect years of dust so I could finally see their potential clearly. Borrowing the idea of musicians like the Beatles releasing albums of B-sides, I put the collection together over several weeks, gathering more recent poems and those fostered out to various anthologies but have never lived under one roof in my name. So, the volume is really my work over some 32 years, an eclectic (some would say eccentric) mixed-bag of styles, themes, voices and forms. Where does this book fit in contemporary Singaporean literature? Here, I am wondering about the work of peers that you like, and the broader ecosystem in which you work? I’m probably not the best, nor the most objective person, to assess where this new book fits in contemporary Singaporean literature. But if I could extend your analogy of the ecosystem – it’s mostly likely a bottom-feeder, since it’s adept at salvaging and surviving on odds and ends. What do you have to say to the world that’s worth saying? How do you know you would not disown this manuscript ten years from now? I’ve been collaborating with two wonderfully-talented musicians, Natalie Ng and Mervin Wong. It’s hard to pin a genre on our work because it’s part soundscape, part spoken-word poetry and part classical music. Which is why we name our art collective Osmosis. So far, we’ve had positive feedback to our performances. This year, we’re due to perform at two festivals in Singapore, in March and July. In addition, because of my creatively promiscuous nature, I will collaborate with two other musicians who will turn lyrics I have written into songs. Our showcase is called Same Words, Different Songs and – if it is not jinxed by my big mouth blabbing about it here – will take place at the Esplanade in March. It seems my work is increasingly veering into the performative arts, as I’ve also penned a three-act poetic monologue, which might be staged at some point this year, if all the stars and my Hail Marys are aligned. I will also be launching two children’s picture books, if all comes to pass. When Lesley’s fifth child Jack is born profoundly deaf, she and her family become unexpected and powerful advocates for CALD communities. 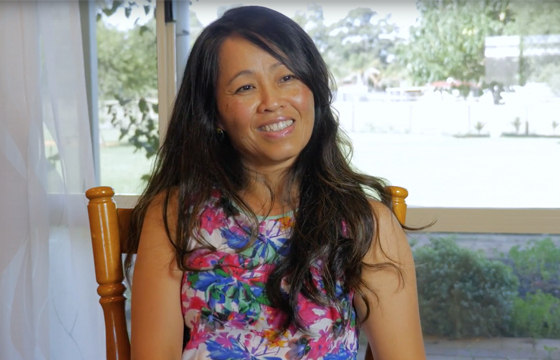 After jumping on a boat with her ten-day-old son to travel from Vietnam to Perth, Phuong rebuilds her life from scratch. Niru Singla has a Bachelor of Arts and an Advanced Diploma in Fashion Design and hopes to one day enter the Australian fashion industry.